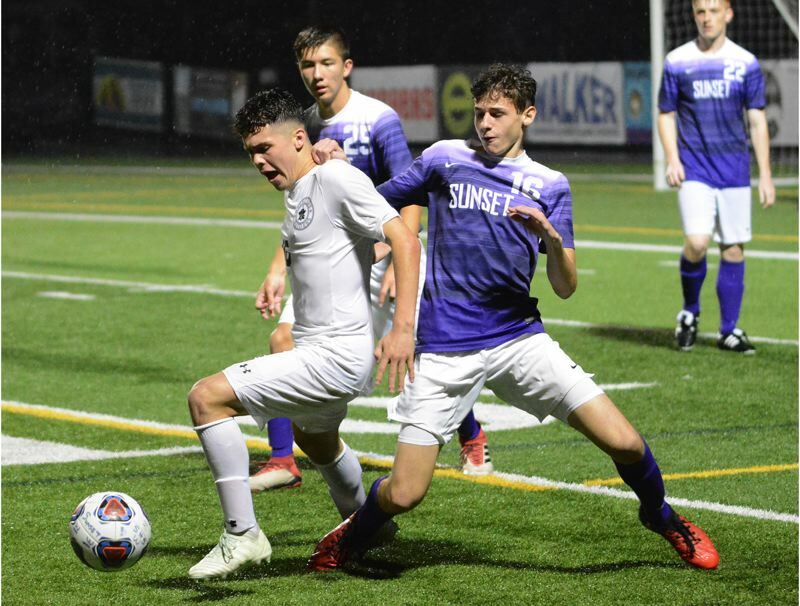 BEAVERTON — The Reynolds boys soccer team didn't surrender a goal in the flow of play Saturday night, but dropped a heartbreaker 3-2 in penalty kicks to Sunset in the first round of the playoffs. Reynolds overcame a two-goal deficit in the second half when Gerardo Meija scored off a close-range free kick, and Alan Gaytan buried a penalty shot less than five minutes apart. Neither side could produce a winnin goal over the final 15 minutes of regulation or the extra 20 minutes of overtime. The teams combined to go 10-for-10 in the shootout, sending it to a sixth round of sudden death to decide which team would advance. Sunset goalie Kellen Gullion dived to his right, twisted his body in mid-air and raised a hand up high to deflect a Raiders' shot off target for the win. "It's a lottery," Berry said of the shootout. "I honestly believe that we deserved to win that game, but we'll be back next year." Sunset (9-6-0) plays at PIL-champion Grant in the second round at 7 p.m. Tuesday at the Marshall campus field. Look for expanded coverage ahead in our Tuesday, Oct. 30, print edition.